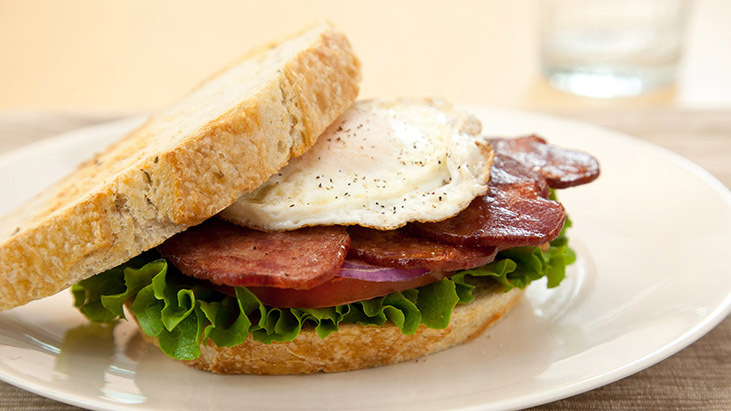 Adding a fried egg to a BLT transforms it from a lunch favorite to a craveable breakfast option. Chef Nolot gives the sandwich a unique twist by using duck bacon along with heirloom tomatoes, limestone lettuce and artisanal bread. 1. In small bowl, gently toss tomato slices and red onion with olive oil, rice vinegar and chopped parsley. Season generously with sea salt and black pepper and set aside. 2. In skillet over medium heat, cook duck bacon, turning until crisp. Transfer to plate and return skillet with any drippings to the stove. 3. Add brown sugar and bourbon to skillet; cook over low heat until mixture starts to thicken. 4. Add cooked duck bacon back to mixture in skillet; continue to cook for 30 seconds until thoroughly coated. Place duck bacon on a plate and set aside. 5. Spread mayonnaise on one piece of toast; top with duck bacon, marinated tomato salad and lettuce. 6. In small, nonstick skillet over medium-high heat, melt butter. Add the egg; fry, turning once, until it starts to crisp around edges; the yolk should still be runny. 7. Slide egg on top of lettuce, sprinkle egg with sea salt and black pepper, close sandwich and eat immediately.